Ida Bell Wells-Barnett (1862 – 1931) was a black journalist, and newspaper editor, who with her husband, newspaper owner Ferdinand L. Barnett, was an early leader in the civil rights movement. The lives of W.E.B. Du Bois and Ida B. Wells often ran along parallel tracks, both using their journalistic writing to condemn lynching in the U.S. 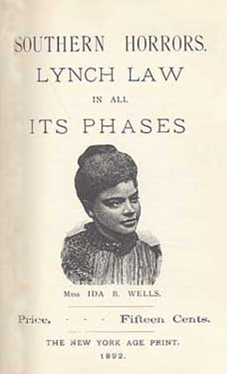 In her 1892 book on the subject, she documented how lynching was often a way to control or punish blacks who competed with whites. Research where in the U.S. the most complete records of lynchings are kept.